This data set provides two data files in text format (.txt). One file contains biomass measurements made in 1948 and between 1967 and 1970 for a humid temperate steppe in the Khomutovskaya Steppe Nature Reserve in the Donezk Region of Ukraine. The second file contains monthly and annual climate data for the study site for the period 1955-1972. Biomass measurements were made once in July of 1948 and biweekly to monthly during the growing season (April-August/September) from 1967 to 1970 at the permanent Khomutovskaya research station. Above-ground net primary procuction (ANPP) was calculated for each sampling date and cumulatively over the four years, 1967-1970. Averaged over the time series, above-ground live phytomass, standing dead, and litter biomass were estimated to be 340, 90, and 240 g/m2 (dry matter weight), respectively, while below-ground phytomass and mortmass were estimated to be 1,675 and 792 g/m2 (dry matter weight), respectively. ANPP was estimated to be 460 g/m2/yr. BNPP was estimated to be 1,340 g/m2/yr. The study site is one of eight major grassland types of Eurasia which encompass an extremely wide climatic gradient in the direction of increasing maximum summer temperatures and continentality and decreasing precipitation in a north-west to the south-east band of steppes in the European and Asian parts of the former USSR (Commonwealth of Independent States). Khomutov, on calcareous chernozem soils, is representative of the typical Priazoviya feather-grass steppe that was once widely distributed over the Black Sea Lowlands. The site had annual mean maximum/minimum temperatures of 31.9/-9.7 degrees C and annual mean precipitation of 437.8 mm for the period 1953-1989. Figure 1. 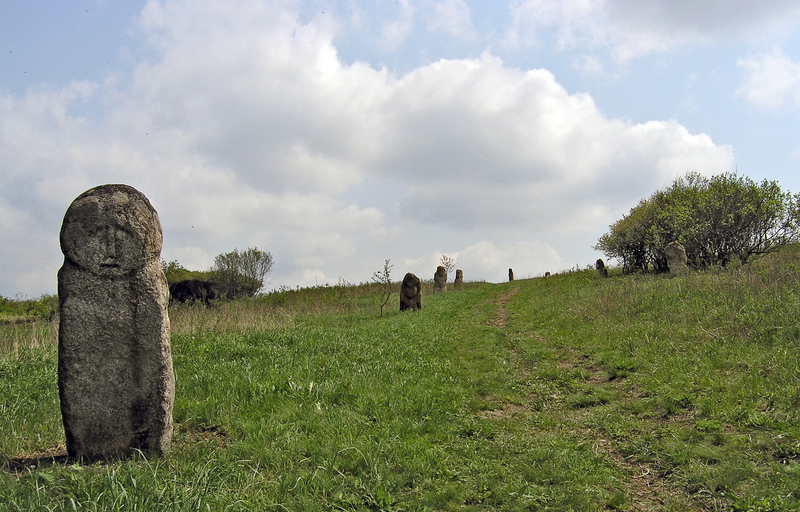 The Khomutovskaya Steppe Natural Reserve with ritual stone sculptures. Gilmanov, T.G. 1996. NPP Grassland: Khomutov, Ukraine, 1948-1970. Data set. Available on-line [http://daac.ornl.gov] from Oak Ridge National Laboratory Distributed Active Archive Center, Oak Ridge, Tennessee, U.S.A. The Khomutov data set contains biomass measurements that were made once in July of 1948 and biweekly during the growing season (April-August/September) from 1967 to 1970 at the permanent Khomutovskaya research station. ANPP was calculated for each sampling date and cumulatively over the four years, 1967-1970. The study site represents the typical humid temperate steppe that was once widely distributed over the Black Sea Lowlands. The site has an annual mean maximum/minimum temperature of 31.9/-9.7 C and annual mean precipitation of 437.8 mm for the period 1953-1989. Averaged over the time series, above-ground live phytomass, standing dead, and litter biomass were estimated to be 340, 90, and 240 g/m2 (dry matter weight), respectively, while below-ground phytomass and mortmass were estimated to be 1,675 and 792 g/m2 (dry matter weight), repectively (Gilmanov et al., 1997). ANPP was estimated to be 460 g/m2/yr (Gilmanov et al., 1997) which agrees with values published in Olson et al. (2013a, b) and Scurlock and Olson (2013). Evdokimova et al. (1976) estimated annual root biomass increment on virgin Khomutov steppe to be 1,340 g/m2/yr. Biomass measurements at the Khomutov site were made in July 1948 and seasonally during the four-year period 1967-1970. ANPP estimates are available for 1967-1970. Cumulative ANPP was estimated for each sampling date. Above-ground biomass compartments (live phytomass, standing dead, and litter) were harvested once in early July in 1948 and at biweekly to monthly intervals each year from 1967 through 1970. The 1967-1970 data were used to calculate biweekly to monthly estimates of ANPP. Cumulative ANPP was estimated for each sampling date. NPP Data. Biomass and ANPP estimates are provided in one text file (.txt format). The variable values are delimited by semicolons. The first 18 lines are metadata; data records begin on line 19. There are gaps in the time series from 1949 through 1966. All biomass units are expressed in g/m2 (dry matter weight). ANPP and cumulative ANPP are expressed as g/m2 per sampling date (dry matter weight). Table 2. Column headings in NPP file. The time series for this data set is relatively short (1967-1970) and this limitation makes it difficult to reconcile seemingly questionable data. For example, litter biomass collected on 7 April 1967 at Khomutov was much higher than on any other sampling date and higher than the average amount of litter for the period of record. Since litter is mostly decomposed within two years, one may infer that the previous year or two were highly productive which led to a substantial input to the litter compartment in 1967. The Khomutov study site is located within the Khomutovskaya Steppe Natural Reserve, close to the city of Mariupol (formerly Zhdanov) in southeast Ukraine, near the Black Sea. The steppe, also known as a motley sheep's fescue/feather grass steppe, is a humid continental grassland that was once widespread around the Black Sea Lowlands. The Natural Reserve covers more than 1,000 ha. It contains more than 500 varieties of steppe plants including rare and endemic plants. The species richness of this plant community is 23 species per 1 m2 and 60 species per 100 m2, and is dominated by Stipa lessingiana, Stipa capillata, Festuca sulcata, Poa angustifolia, Linozyrus villosa, Medicago romanica, and Salvia nutans. The natural conditions, phytomass, and productivity dynamics of this ecosystem are described by Bystrickaya and Osychnyuk (1975). Figure 2. 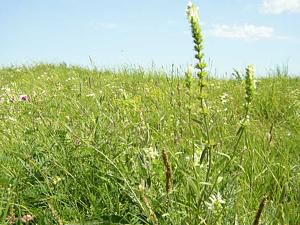 The Khomutov grassland. This is a typical plain feather-grass steppe. It contains more than 500 varieties of steppe plants including rare and endemic plants. The natural conditions, phytomass, and productivity dynamics of the Khomutovskaya steppe are described by Bystrickaya and Osychnyuk (1975). This data set is part of a series of grassland data sets assembled and checked by Dr. Tagir Gilmanov (Gilmanov et al., 1997) from primary literature. Figure 3. 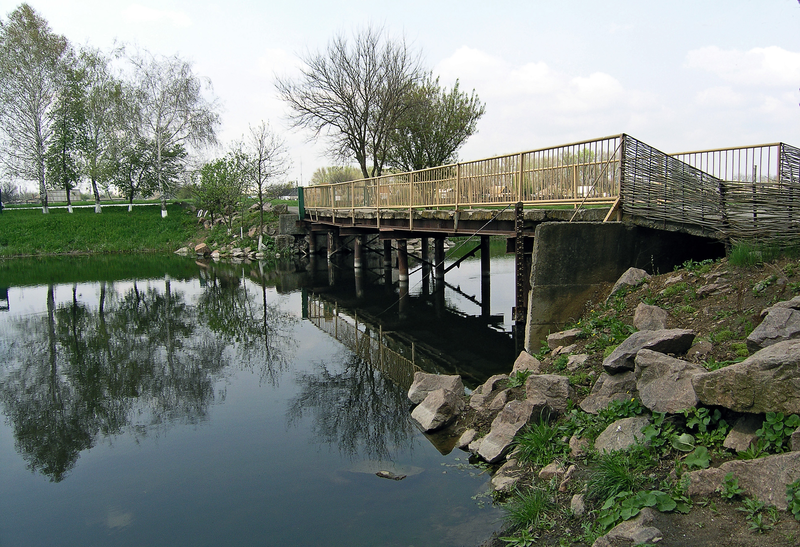 A wooden bridge leads to the entrance to the Khomutovskaya Steppe Nature Preserve in Donetsk Oblast, Ukraine. Bystrickaya, T.L,. and V.V. Osychnyuk. 1975. Soils and primary biological productivity of the steppes of Pryazovye (as exemplified by the "Khomutovskaya Steppe" reserve). Nauka, Moscow. 112 pp. Evdokimova, T.I., L.A. Grishina, V.D. Vasilyevskaya, E.M. Samoilova, and T.L. Bystritskaya. 1976. Biogeochemical cycles of elements in some natural zones of the European USSR. Ecol. Bull. (Stockholm) 22: 135-155.